David Glasgow Farragut /ˈfærəɡət/ (also spelled Glascoe; July 5, 1801 – August 14, 1870) was a flag officer of the United States Navy during the American Civil War. He was the first rear admiral, vice admiral, and admiral in the United States Navy. He is remembered for his order at the Battle of Mobile Bay usually paraphrased as "Damn the torpedoes, full speed ahead" in U.S. Navy tradition. Born near Knoxville, Tennessee, Farragut was fostered by naval officer David Porter after the death of his mother. Despite his young age, Farragut served in the War of 1812 under the command of his adoptive father. He received his first command in 1824 and participated in anti-piracy operations in the Caribbean Sea. He served in the Mexican–American War under the command of Matthew C. Perry, participating in the blockade of Tuxpan. After the war, he oversaw the construction of the Mare Island Naval Shipyard, the first U.S. Navy base established on the Pacific Ocean. Though Farragut resided in Norfolk, Virginia prior to the Civil War, he was a Southern Unionist who strongly opposed Southern secession and remained loyal to the Union after the outbreak of the Civil War. Despite some doubts about Farragut's loyalty, Farragut was assigned command of an attack on the important Confederate port city of New Orleans. After fighting past Fort St. Philip and Fort Jackson, Farragut captured New Orleans in April 1862. He was promoted to rear admiral after the battle and helped extend Union control up along the Mississippi River, participating in the Siege of Port Hudson. With the Union in control of the Mississippi, Farragut led a successful attack on Mobile Bay, home to the last major Confederate port on the Gulf of Mexico. Farragut was promoted to admiral following the end of the Civil War and remained on active duty until his death in 1870. Farragut was born in 1801 to Jordi (George) Farragut, a native of Menorca, Spain, and his wife Elizabeth (née Shine, 1765–1808), of North Carolina Scotch-Irish American descent, at Lowe's Ferry on the Holston River in Tennessee. It was a few miles southeast of Campbell's Station, near Knoxville. His father operated the ferry and served as a cavalry officer in the Tennessee militia. Jordi Farragut, son of Antoni Farragut and Joana Mesquida, became a Spanish merchant captain from Menorca. He joined the American Revolutionary cause after arriving in America in 1766, when he changed his first name to George. George was a naval lieutenant during the Revolutionary War, serving first with the South Carolina Navy then the Continental Naval forces. George and Elizabeth had moved west to Tennessee after his service in the American Revolution. Through the influence of his foster father, Farragut was commissioned a midshipman in the United States Navy on December 17, 1810, at the age of seven. [note 1] A prize master by the age of 12, Farragut fought in the War of 1812, serving under Captain Porter, his foster father. While serving aboard USS Essex, Farragut participated in the capture of HMS Alert on August 13, 1812, then helped to establish America's first naval base and colony in the Pacific, named Fort Madison, during the ill-fated Nuku Hiva Campaign in the Marquesas Islands. At the same time, the Americans battled the hostile tribes on the islands with the help of their Te I'i allies. In 1853, Secretary of the Navy James C. Dobbin selected Commander David G. Farragut to create Mare Island Navy Yard near San Francisco in San Pablo Bay. 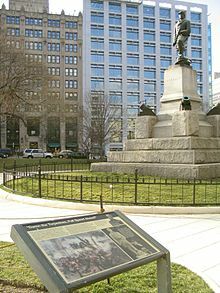 In August 1854, Farragut was called to Washington from his post as assistant inspector of ordnance at Norfolk, Virginia. President Franklin Pierce congratulated Farragut on his naval career and the task he was to undertake. On September 16, 1854, Commander Farragut arrived to oversee the building of the Mare Island Navy Yard at Vallejo, California, which became the port for ship repairs on the West Coast. Captain Farragut commissioned Mare Island on July 16, 1858. Farragut returned to a hero's welcome at Mare Island on August 11, 1869. Though living in Norfolk, Virginia prior to the American Civil War, Farragut made it clear to all who knew him that he regarded secession as treason. Just before the war's outbreak, Farragut moved with his Virginian-born wife to Hastings-on-Hudson, a small town just outside New York City. On April 18, Farragut ordered the mortar boats, under the command of Porter, to commence bombardment on the two forts, inflicting considerable damage, but not enough to compel the Confederates to surrender. After two days of heavy bombardment, Farragut ran past forts Jackson and St. Philip and the Chalmette batteries to take the city and port of New Orleans on April 29, a decisive event in the war. Farragut's flotilla was forced to retreat with only two ships able to pass the heavy cannon of the Confederate bastion. After surviving the gauntlet, Farragut played no further part in the battle for Port Hudson, and General Banks was left to continue the siege without the advantage of naval support. The Union Army made two major attacks on the fort; both were repulsed with heavy losses. Farragut's flotilla was splintered, yet was able to blockade the mouth of the Red River with the two remaining warships; he could not efficiently patrol the section of the Mississippi between Port Hudson and Vicksburg. Farragut's decision proved costly to the Union Navy and the Union Army, which suffered its highest casualty rate of the war at Port Hudson. From his high perch, where he was lashed to the rigging of his flagship, USS Hartford, Farragut could see the ships pulling back. "What's the trouble?" he shouted through a trumpet to USS Brooklyn. "Torpedoes", was the shouted reply. "Damn the torpedoes. ", said Farragut, "Four bells, Captain Drayton, go ahead. Jouett, full speed." The bulk of the fleet succeeded in entering the bay. Farragut triumphed over the opposition of heavy batteries in Fort Morgan and Fort Gaines to defeat the squadron of Admiral Franklin Buchanan. After the Civil War, Farragut was elected a companion of the first class of the New York Commandery of the Military Order of the Loyal Legion of the United States on March 18, 1866 and assigned insignia number 231. He served as the commander of the Commandery of New York from May 1866 to until his death. Farragut was promoted to full admiral on July 25, 1866, becoming the first U.S. Navy officer to hold that rank. His last active service was in command of the European Squadron, from 1867 to 1868, with the screw frigate USS Franklin as his flagship. 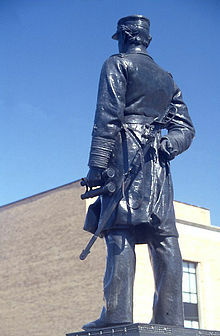 Farragut remained on active duty for life, an honor accorded to only seven other U.S. Navy officers after the Civil War. Admiral Farragut died from a heart attack at the age of 69 in Portsmouth, New Hampshire, while on vacation in the late summer of 1870. He had served almost sixty years in the navy. He is interred at Woodlawn Cemetery, in The Bronx, New York City. His gravesite is listed on the National Register of Historic Places, as is Woodlawn Cemetery itself. After the death of his first wife, Farragut married Virginia Dorcas Loyall, on December 26, 1843, with whom he had one surviving son, named Loyall Farragut, born October 12, 1844. Loyall Farragut graduated from West Point in 1868, and served as a second lieutenant in the U.S. Army before resigning in 1872. He spent most of the remainder of his career as an executive with the Central Railroad Company of New Jersey. Loyall died on October 1, 1916, as noted on one side of the family monument which he and his mother erected to the memory of his father in Woodlawn Cemetery. Farragut had a brother named William A. C. Farragut. William was also in the Navy but had a far less distinguished career. He was warranted as a midshipman on 16 January 1809 (a year before David Farragut would begin his career) and was promoted to lieutenant on 9 December 1815. William remained at that rank until he was transferred to the Reserve List on 15 December 1855. He died on 20 December 1859. David Farragut was initiated to the Scottish Rite Masonry. Mexican–American War, commanded the sloop of war Saratoga. Farragut Naval Training Station, located in Northern Idaho on Lake Pend Oreille, was a WWII naval training center, the second largest in the world at the time with over 293,000 sailors receiving basic training there. In 1966, the state of Idaho turned the land into Farragut State Park. Admiral Farragut Academy, named after Admiral David G. Farragut, was founded in 1933 as an all-boys military boarding high school. Today, the Academy is a college-prep, private school which serves students in PreK-12th grade and is located in St. Petersburg, Florida. The Upper School, which starts in 8th grade, is also known worldwide for its Boarding program and Naval JROTC military structure. Farragut also offers other signature academic programs: Aviation, Scuba, Marine Science, Engineering, Sailing, and more. Farragut, Iowa is a small farming town in southwestern Iowa. Admiral Farragut's famous slogan greets visitors from a billboard on the edge of town. The local school, Farragut Community High School, fielded varsity "Admiral" and JV "Sailor" teams until its closure in 2016. The school also houses memorabilia from the ships that have borne the Farragut name. A hotel in Menorca at Cala'n Forcat. In the Star Trek franchise, a number of Starfleet starships are named Farragut. In her 2010 spoken-word debut, Olivia Hedrick released a track "How I love thee Mister Farragut"
Farragut is mentioned in The Wild Wild West episode "The Night of the Kraken", although he does not appear. At the climax, the story's villains try to destroy Farragut's ship with a naval mine, but are foiled by the series' heroes. ^ Some sources place the age at eleven. ^ Samuel Fallows et al. (1900) Splendid Deeds of American Heroes on Sea and Land, J. L. Nichols & Co.
^ a b "Admiral David Farragut". Son of the South. Retrieved 11 November 2010. ^ "Saratoga III (Sloop-of-War)". history.navy.mil. ^ The others were his foster brother David Dixon Porter, Stephen Clegg Rowan, George Dewey, William Leahy, Ernest King, Chester W. Nimitz, and William Halsey. ^ Hearn, Chester G. (1998). Admiral David Glasgow Farragut: The Civil War Years. Annapolis, MD: Naval Institute Press. pp. xxi+385. ISBN 1-55750-384-2. ^ "Loyall Farragut • Cullum's Register • 2266". penelope.uchicago.edu. ^ "Famous men members of Masonic Lodges". American Canadian Grand Lodge ACGL. Archived from the original on Nov 17, 2018. ^ Henry C. Clausen (1976). Masons who Helped Shape Our Nation. Google Books. Southern Jurisdiction, U.S.A.: Supreme Council, 330, A.A. Scottish Rite of Freemasonry. p. 30. OCLC 2392477. Archived from the original on Oct 20, 2018. 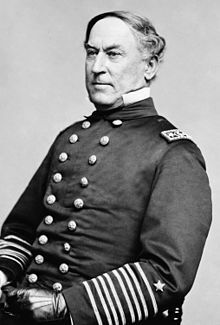 ... Admiral David Farragut, for example, was one of the great Freemasons who won recognition from all sides for his bravery. ^ Farragut, Commander D.L. Report from the Naval Testing Battery at Old Point Comfort Va, a journal book filed with the Bureau of Ordnance & Hydrography on August 31, 1853. ^ "Admiral Farragut Academy - FL College-Prep Private School with Boarding". Admiral Farragut Academy. ^ Neely, Jack. Knoxville's Secret History, page 17. Scruffy City Publishing, 1995. Laughton, John Knox (1911). "Farragut, David Glasgow" . Encyclopædia Britannica (11th ed.). This page was last edited on 22 April 2019, at 13:55 (UTC).